Oyo NAWOJ executives visit Resident Electoral Commissioner (REC), Mr Mutiu Agboke . 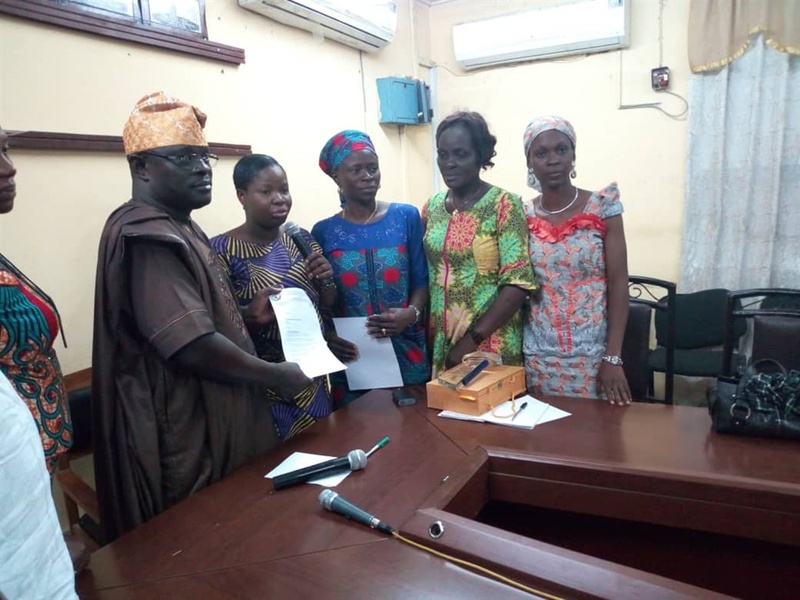 Oyo State Resident Electoral Commissioner (REC), Mr Mutiu Agboke gets a letter of commendation and plaque from the Nigeria Association of Women Journalists (NAWOJ). The Oyo State Resident Electoral Commissioner (REC), Mr Mutiu Agboke has been commended by the state chapter of Nigeria Association of Women Journalists (NAWOJ). The Association said it deemed it fit to honour the electoral umpire and particularly, its REC for meeting the demands placed before him during an earlier visit before the election. Oyo State NAWOJ Chairperson, Comrade Jadesola Ajibola who led other executive members to the commission’s Agodi office gave him an award ito commend and encourage the commission on its efforts at achieving a successful election. She said “We were here about three weeks before the election and made some demands. “We demanded that the election should be free, fair, credible and transparent, we got that. “We demanded that all the parties should be given a level playing ground, we got that. “We also demanded that all the stakeholders be carried along in all the commission's efforts at conducting the election. We got that too. “The REC, with the support of the management team were never tired of giving information anytime we knock on their doors. The Resident Electoral Commissioner said he was shocked that all the efforts of the commission were being appreciated and recognized by journalists. Agboke noted that, although, he didn't do anything spectacular other than aligning with the electoral guidelines as stipulated by the National Headquarters, he feels proud that the members of the management team in the state also shared his passion of doing what is expected of them. He said “We have a guideline and there are provisions for everything and anything we have to do as a commission. All we did was just to follow them to the letter. “I was shocked at the kind of response we have been getting since after the election because we have been largely commended and we are proud of it. “Although the result is there for all to see, I can assure you that no member of INEC in this state can ever be found culpable of any electoral crime of did anything untoward to achieve the result. Agboke was given a letter of commendation and a plaque.